Zoning Control and Add-On Cooling. Zoning control options are available for gas ducted heating system. It allows you to heat up a part of the house instead the whole house, further reducing the running cost of a gas ducted heating system. Add-On Cooling system/refrigerated cooling system can be installed to provide refrigerated cooling to your through same vents. Creating best heating and cooling combination for your home. 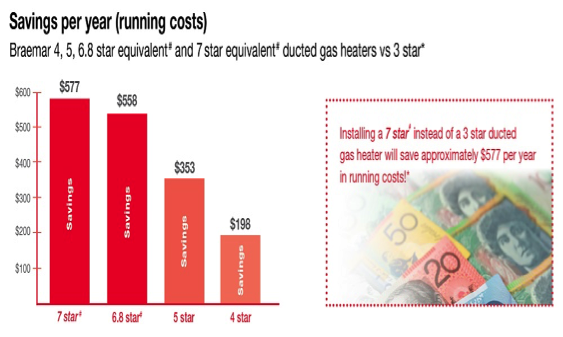 What are the advantages of gas ducted heating over reverse cycle heating? 2, Better performance. Reverse cycle works less efficiently when outside temperature drops. Ducted gas efficiency remains steady. 3, Instant warmth, ducted gas reaches desired temperature much faster than reverse cycle system do. 4, Comfortable air, ducted gas won’t dry your skin and eyes, it’s a different kind of cosy warmth. 5, Less capable cost than purchasing a ducted refrigerated system.